For Beach games or pool games it's necessary to play with a lightweight ball Instead of using heavy balls which is hard to play with the kids. 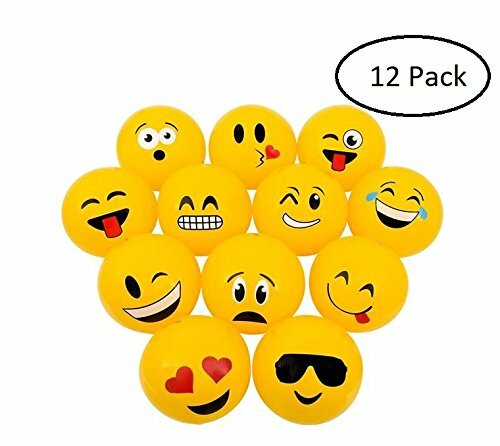 The Srenta 16" soft emoji beach ball is made to provide the best lightweight soft emoji beach ball for playing beach games & pool games.
. This Srenta 16" emoji beach ball is a round shaped ball. it has solid yellow color outlook with different emoticons logos. it can be used in the beach games, festivals, sporting events, concerts, photography or filmography. balls are bounced around crowds at cricket, baseball and football games. it's for fun in the crowd. Great for physical education classes, after-school programs, special events, beach and pool play, and backyard fun. Great for Birthday gift to a Kid. It will put a smile on your kid face. ✓ This Srenta 16" emoji beach ball is an inflatable ball for beach and water games. it's large size and light weight. takes little effort to inflate. it travels very slowly and generally must be caught with two hands. it is popular for beach games, pool games or indoor games for kids. it has a set of soft plastic panels, with two circular end panels, one with an oral inflation valve, intended to be inflated by mouth or pump. this Srenta 16" emoticon beach ball has several emoji's design. SPECS: This Srenta 16 inch emoji beach ball is made of soft plastic. solid yellow color ball with different emoji logos. ✓ DESIGN: this Srenta set of 12 16-inch soft emoji beach balls has a solid yellow color with different emoticon logos. which makes it more attractive to kids & toddlers. ✓ USES: This Srenta 16" emoji beach ball can be used in beach games, pool games, indoor funs & more. this beach balls may be tossed between crowd members at concerts, festivals, and sporting events. this beach ball is also great for swimsuit photography and to promote or represent beach-themed events or locations. ✓ Includes: 1 Dozen of individually wrapped 16-inch emoji beach balls. If you have any questions about this product by Srenta, contact us by completing and submitting the form below. If you are looking for a specif part number, please include it with your message.